Northern Song Dynasty, 1111 C.E. The Song dynasty, also known as the Sung dynasty, was a ruling dynasty in China from 960-1279 C.E. Its founding marked the reunification of China for the first time since the fall of the Tang dynasty in 907. The intervening years, known as the Period of Five Dynasties and Ten Kingdoms, were a time of division between north and south and of rapidly changing administrations. During the Song dynasty, many groups threatened China's northern borders, namely by the Khitans of the Liao dynasty, the Tanguts of the Western Xia dynasty, and the Jurchens of the Jin dynasty. The Song dynasty itself can be divided into two distinct periods: the Northern Song and Southern Song. The Northern Song (Chinese: 北宋, 960-1127) signifies the time when the Song capital was in the northern city of Kaifeng and the dynasty controlled most of inner China. The Southern Song (Chinese: 南宋, 1127–1279) refers to the time after the Song lost control of northern China to the Jurchen Jin dynasty. The Song court retreated south of the Yangtze River and made their capital at Hangzhou. 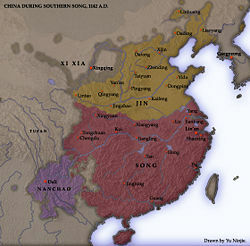 The Jin dynasty was conquered by the Mongol Empire in 1234, which subsequently took control of northern China and maintained uneasy relations with the Southern Song court. Mongke Khan, the fourth great khan of the Mongol Empire, was killed during a military campaign against the Southern Song. His successor, Kublai Khan, unified the throne, recalled the Mongol armies from the Middle East, and finally conquered the Song dynasty in 1279. China was once more unified, but this time as part of the vast Mongol Empire. The founder of the Song dynasty, Emperor Taizu, built an effective centralized bureaucracy staffed with civilian scholar-officials. Regional military governors and their supporters were replaced by centrally appointed officials. This system of civilian rule led to a greater concentration of power in the emperor and his palace bureaucracy than had been achieved in the previous dynasties. The Song dynasty is notable for the development of cities not only for administrative purposes but also as centers of trade, industry and maritime commerce. The landed scholar-officials, sometimes collectively referred to as the gentry, lived in the provincial centers alongside the shopkeepers, artisans and merchants. A new group of wealthy commoners—the mercantile class—arose as printing and education spread, private trade grew, and a market economy began to link the coastal provinces and the interior. Landholding and government employment were no longer the only means of gaining wealth and prestige. The development of paper money and a unified tax system meant the development of a true nationwide market system. Accompanying this was the beginnings of what one might term the Chinese industrial revolution. For example the historian Robert Hartwell has estimated that per capita iron output rose six-fold between 806 and 1078, such that, by 1078 China was producing 125,000 tons of iron per year, a per capita consumption of roughly 1.5 kilograms of iron per year (compared to 0.5 kilograms in Europe). This iron was used to mass produce ploughs, hammers, needles, pins, cymbals among other routine items for an indigenous mass market and for trade with the outside world, which also expanded greatly at this point. The Chinese invented or developed gunpowder, the cannon, the flamethrower (as did the Byzantines with Greek fire), and printing technology which increased literacy with the mass production of printed materials. This meant that parents could encourage sons to learn to read and write and therefore be able to take the Imperial examination and become part of the growing learned bureaucracy. As a result of these innovations (and the concurrent agricultural revolution) China boasted some of the largest cities of the world at this time. For example it has been estimated that Hangzhou had more than 400,000 inhabitants by 1200: far larger than any European city—in Western Europe, only Paris and Venice had a population of over 100,000. According to the most common estimates, the GDP per capita income with purchasing power parity under the Song dynasty was estimated to be over $600 in 1990 international dollars, whereas Western Europe had a per capita income of roughly $550 by 1000 C.E. However, Western Europe started to become slightly wealthier in per capita income than China after 1300 C.E. The Song dynasty was the most brilliant cultural era in the later part of Chinese history. The early Northern Song dynasty was noted for their magnificent paintings of landscapes. Artists fled to the mountains escaping the turbulence occurring at the end of the Tang dynasty. Receiving inspiration form the magnificent landscape, they found peace and moral order which they thought to be lacking in mankind. Under the auspices of the Imperial Painting Academy and after the Five Dynasties period painters where recruited from throughout the empire to serve the needs of the court. This would all change under Neo-Confucianism. Culturally, the Song refined many of the developments of the previous centuries. This included refinements of the Tang ideal of the universal man, who combined the qualities of scholar, poet, painter and statesman, but also historical writings, painting, calligraphy, hard-glazed porcelain and Chinese Inkstones. Song intellectuals sought answers to all philosophical and political questions in the Confucian Classics. This renewed interest in the Confucian ideals and society of ancient times coincided with the decline of Buddhism, which the Chinese regarded as foreign and offering few practical guidelines for the solution of political and other mundane problems. The Song Neo-Confucian philosophers, finding a certain purity in the originality of the ancient classical texts, wrote commentaries on them. The most influential of these philosophers was Zhu Xi (1130-1200), whose synthesis of Confucian thought and Buddhist, Daoist, and other ideas became the official imperial ideology from late Song times to the late nineteenth century. As incorporated into the Imperial examination system, Zhu Xi's philosophy evolved into a rigid official creed, which stressed the one-sided obligations of obedience and compliance of subject to ruler, child to father, wife to husband and younger brother to elder brother. The effect was to inhibit the societal development of pre-modern China, resulting in many generations of political, social and spiritual stability as well as in a slowness of cultural and institutional change up to the nineteenth century. Neo-Confucian doctrines also came to play the dominant role in the intellectual life of Korea, Vietnam and Japan. Before the arrival of the Jurchens the Song dynasty was for centuries engaged in a stand-off against the Western Xia and the Khitan Liao dynasty. This balance was disrupted when the Song Dynasty developed a military alliance with the Jurchens with the purpose of annihilating the Liao dynasty. This balance of power disrupted, the Jurchens then turned on the Song Dynasty, resulting in the fall of the Northern Song and the subsequent establishment of the Southern Song. A new triangular arrangement was formed, between the Song, Jin and Western Xia. The Southern Song deployed several military commanders, among them Yue Fei and Han Shizhong. Yue Fei in particular had been preparing to recapture Kaifeng (or Bianjing, as the city was known during the Song period), the former capital of the Song Dynasty and the then southern capital of the Jin dynasty, after a streak of uninterrupted military victories. The possible defeat of the Jurchens however threatened the power of the new emperor of the Southern Song Gaozong and his premier Qin Hui. The reason was that Qinzong, the last emperor of the Northern Song, was living in Jin-imposed exile in Manchuria and had a good chance of being recalled to the throne should the Jin dynasty be destroyed. Emperor Gaozong signed the Treaty of Shaoxing in 1141, which conceded most of the territory regained through the efforts of Yue Fei. Yue Fei in particular was executed under the terms of the treaty in 1142. In 1153, Jin emperor Wányán Liàng (完顏亮) moved the empire's capital from Huining Fu in northern Manchuria (south of present-day Harbin) to Zhongdu (now Beijing). Four years later in 1157, he razed Beijing, including the nobles’ residences and moved the Jurchen “southern” capital from Beijing to Kaifeng, former seat of the Song dynasty and began to reconstruct it (since its sack in 1127). Emperor Wányán Liàng attacked the Southern Song in 1161. Meanwhile, two simultaneous rebellions of Jurchen nobles, led by soon-to-be crowned Jin emperor Wányán Yōng (完顏雍) and Khitan tribesman erupted in Manchuria, forcing the Jin to withdraw its troops from southern China to quell the uprisings. The Jin navy was wiped out by a smaller Song fleet because of their use of gunpowder, the first recorded use in military history. Emperor Wányán Liàng failed in taking the Song and was assassinated by his own generals in December 1161. His son and heir was also assassinated in Kaifeng. Although crowned in October, Emperor Wányán Yōng was not officially recognized as the fifth successive Jin emperor until the murder of Wányán Liàng’s heir. The Khitan uprising was not suppressed until 1164; their horses were confiscated so that the rebels had to take up farming. Other Khitan and Xia cavalry units had been incorporated into the Jin army. The Treat of Lóngxīng was signed in 1164 and ushered in 44 years of peace between the two empires. Following the death of Gaozong and the emergence of the Mongols, the Song dynasty formed a military alliance with the Mongols in the hope of finally defeating the Jin dynasty. Several tens of thousands of carts of grain were sent to the Mongol army during the siege. Following the destruction of the Jurchens, the Southern Song generals broke the alliance, proceeding to recapture the three historical capitals of Kaifeng, Luoyang and Chang'an. However, the cities, ravaged by years of warfare, lacked economic capacity and yielded little defensibility. The Mongols eventually gained the upper hand and in 1276 the Southern Song court fled to Guangdong (廣東) by boat. Emperor Gong of Song China was left behind. Any hope of resistance was centered on two young princes, Emperor Gong's brothers. The older boy, Zhao Shi, who was nine years old, was declared emperor; and in 1277, the imperial court sought refuge in Silvermine Bay (or Mui Wo) on Lantau Island and later in what is today Kowloon City, Hong Kong (see also Sung Wong Toi). The older brother became ill and died, and was succeeded by the younger Zhao Bing, aged seven. 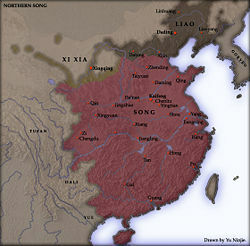 On March 19, 1279, the Song army was defeated in its last battle, the Battle of Yamen, fought against the Mongols in the Pearl River Delta; subsequently a high official is said to have taken the boy emperor in his arms and jumped from a clifftop into the sea, drowning both of them (See Sung Wong Toi). Hau Wong, an official from this court, is still revered as a god in Hong Kong. Despite the fact the Southern Song was conquered, they had fought the longest against the Mongols out of any other nations and despite its relative close geographical location, remained one of the last places the Mongols successfully invaded. During a military campaign in Southern China, the Mongols suffered one of the most humiliating defeats, notably the death of Mongke Khan, the first and only khan ever to die during an invasion. Mongke's death in 1259 led to the recall of the main Mongol armies in the Middle East and a joint invasion of Southern China which finally succeeded in 1279. Convention: "Song" + temple name or posthumous name, except last emperor, who was revered as Song Di Bing (Song Dì Bǐng, 宋帝昺). This page was last modified on 11 October 2015, at 15:37.